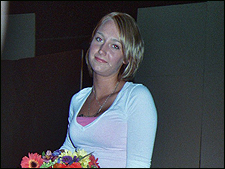 Josie Moore—Bear Fever’s “Jill-of-all-Trades” poses on BASH’s old auditorium stage after the final “Insight” taping of her high school career. 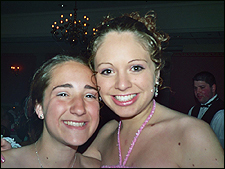 Sarah Elphick (left) and Caity Fisher (rt), two of Bear Fever’s Adopt-a-Bear journalists, share smiles. Josie Moore—Bear Fever’s “Jill-of-All-Trades” cradles the flowers offered to Mrs. Stahl on the final “Insight” show of their high school careers. 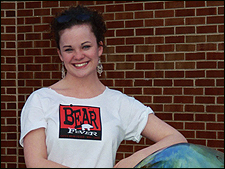 Carly Banes, Bear Fever’s Student Promotions Chair, demonstrates the spirit of Bear Fever with her winning smile. 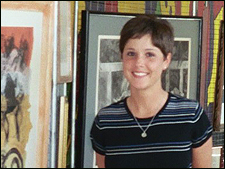 Carly Banes, Bear Fever’s Student Promotions Chair, poses with “Herbie,” sponsored by Herb Real Estate and fashioned by folk artist Barbara Strawser at Arts Expo 2005.